This morning I am blessed hearing the birds chirping outside my window. The winter months have been hard on the birds, wildlife and all of us here in the East. But, Spring is finally emerging, shaking off her sleepiness and shining on us. 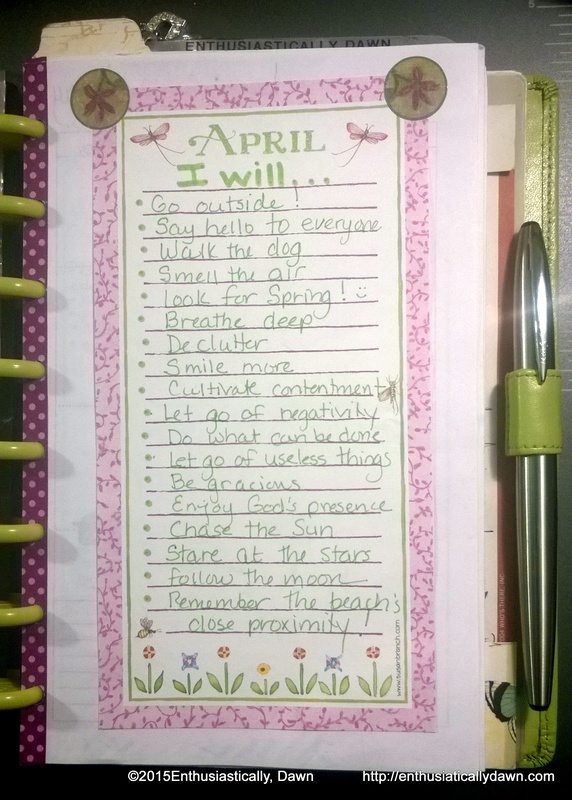 I wrote this list one morning a couple of weeks ago as I sat with my planner, Bible and journal. I think I was feeling overwhelmed, behind and cluttered in every way. I shared a picture the list of my little reminders to myself on Social Media and received so many positive comments I thought I’d share it here on the blog. May the words inspire you to make your own list of affirming reminders for days you feel overwhelmed. *Remember the Beach’s close proximity! May the Lord bless you as you face each day confident of and IN His Love. Thank you Dawn. I feel inspired to journal my own list and I already know much of it is identical to yours. My focus is and has been on many of these “ToDo’s” already as spring came and went in Sunny- CA and we are heading into summertime. What I love about this list is the hidden value of the “To Dos” that are really “To Bes” For me life springs up out of the “To BEs” that are “To Dos”. Today I am running to my “To Be” list and looking forthe opportunity to be Present in my life. I think I am going to make a “To Be” list. Again much gratitude for you and your enthusiastic inspiration. Be present- one of my faves! Have a great day! Great list. I especially like the last one about remembering how close you are to the beach. I often get caught up in the business of work, maintaining the house and the business of parenting and I forget to take the time to get outside and just enjoy the season. We are about 40 minutes from a great beach in Florida and sometimes I will go several weeks without taking the time to enjoy it. So simple and yet inspiring at the same time. I am going to make a sincere effort to journal more; even ifs it’s just a list. It’s a cool refreshing way to jot what’s in your mind and heart. And a way to revisit what’s important and purge what’s not. Amen, Karen! An ongoing challenge that is, right. Thanks for coming by and commenting and for your the Together we Blog page. I love this Dawn! Now I know what the month list in the back of the book is for,,, I thought it was for grocery list. NOW I will be doing this! Love your list. I like to think of is being more than doing…what do I need to do that will help me be who God wants me to be. 😉 Thanks for dropping by today! I love your list. Several years ago, I needed to think spring was on it’s way. I wrote down the signs as they appeared, It seems like I started in February,so my list was rather lengthy. Miss you. Let’s get together!